NEWPORT, RI, August 2006 – "You are among the fundamentally content ... breezy and dry and warm … food that is second to none …vistas that are soothing and serene." Hats off to writer Quentin Warren whose sentiments in a new and stunning 150-page, 4-color magazine come as close as possible to the experience of an escape to the jewel of the Caribbean, St. Barts. Wimco Villas has just published its 28th edition of the Vendome Guide: Wimco's St. Barthelemy, a photo-driven adventure that transports the viewer directly to eight square miles of paradise, from beach to boutique to villa. A key focus, naturally, is on the St. Bart's villa experience, the delivery of which Wimco has perfected over the course of 23 years. The guide details a day in the life of St. Barts, beginning with pool-side coffee at the villa, a trip to the beach and then into town to assuage some retail angst, and then it's back to the privacy of the villa to prepare for a twilight rendezvous and repast. This edition of the Vendome Guide is full of useful travel planning information including a helpful checklist that guides the villa client through the entire vacation experience from booking the villa and plane tickets to choosing what to do on island. The list of activities and services hints at an experience to which we all desire to become accustomed. 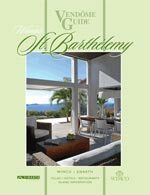 For the upcoming season there are 255 villas on St. Barts available through Wimco, 202 of which are gloriously displayed in the guide. New to this edition are 22 newly constructed or recently renovated villas – a tasteful blend of elegance and amentities. In addition, Wimco also partners with the island's finest hotels, an attractive vacation option for those staying less than a week or desiring round-the-clock services and staff. And as sometimes happens, villa clients seek to become villa owners on St. Barts themselves, so there's a section called "Investing in Paradise" with counsel from Wimco's island partner, Sibarth Real Estate. The advertisements from Cartier to Ligne St. Barth are stunning. And there are no annoying advertising cards that fall out of the publication. To obtain a copy of the guide simply call Wimco Villas' toll-free number 877-264-8455 or if reading this online, click here. Wimco is the leading marketer of private villa rentals in the Caribbean and Europe. For over 23 years, the Company has been sending clients to its portfolio of private villas and distinctive hotels in St Barts, St Martin, Barbados, Italy, France, Mykonos and many other desirable vacation destinations. Wimco Villas offers a concierge service and can assist clients with booking airline tickets, organising car hire and villa rentals. Wimco can also arrange babysitting, book massages or tennis courts, organise watersport rentals, and an in-house chef service for all villas. Fortune Magazine recently rated Wimco amongst the top 5 villa specialists in the world as the result of its strict selection standards for high quality properties, the largest exclusive portfolio of properties in the Caribbean and Europe and its award winning client service. Forbes Magazine recently rated Wimco's online villa rental service “Best of the Web”.